Wow, all your suggestions made me rethink why I have not explored this area of the repertoire. I am always cautious with vocal repertoire however. As for Rameau's suites: I will go for Scott Ross any day. but I guess that most of you here won't appreciate Rameau on the piano. I hope to listen to Ross again and review his marvellous account too. I have not listened to it in a while. Very nice music, I quite like it. French baroque, late XVII century, consists of seven suites of variable lengths, mostly dance movements. Stylistically most reminiscent of Louis Couperin, to my not so finely atuned ear at least. There seems to be very little known on Le Roux and even those suites aren't decidedly for harpsicord (though they certainly sound very right on it). Meyerson and Crawford play two harpsicord version and play it very nicely on two fine french instruments (Taskin 1769, Goermans 1764). I'd definitely recommend hearing Le Roux. This disc is pretty much oop, Rousset plays solo on L'Oiseau Lyre, there is Naxos disc (mix of one and two harpsicords), and there is one disc on some small french label which I can't quite figure out. Maybe our resident french baroque expert could add more, if those Corsican fishermen haven't caught up with him. Here is Gramophone review, first two paragraphs are ok, third is usual superfluous flowery galanterie. "Gaspard Le Roux was active in Paris as a composer during the later years of the seventeenth and first decade of the eighteenth centuries. Apart from his music, of which the little that is known was printed, we know hardly anything about this shadowy figure in French musical life. But in his own time Le Roux was evidently quite a prominent musician, and the fact that Bach’s pupil, Krebs, had copied one of Le Roux’s suites – Bruce Gustafson mentions this in his informative note – is some indication of his standing further afield. Le Roux’s suites – there are seven of them – were published in Paris in 1705, and were not exclusively designed as harpsichord music. In fact Le Roux wrote out the parts in such a way that the pieces could be played by two melody instruments and figured bass, by a solo harpsichord or by two harpsichords. It is this last realization that has been chosen by Mitzi Meyerson and Lisa Crawford, who play two mid-eighteenth-century French harpsichords. These highly adaptable Pieces de clavessin offer in such performances wonderful opportunities for resonant sonority and imaginative elaboration, over and above the specified ornaments that are such a distinctive feature of harpsichord music of the grand siecle. None of this is lost on Meyerson and Crawford, whose rhythmic playing and vital responses to Le Roux’s inventive talent make for engaging entertainment. Each suite contains the three basic ingredients of allemande, courante and sarabande; thereafter a profusion of preludes, menuets, gavottes and other galanteries provide the complement. There are many splendid pieces here, ranging from noble allemandes and sprightly courantes, to sarabandes whose expressive puissance and often melancholy inflexions make them among the most rewarding of all the assembled dances. Two of them seem to me worthy of special mention, that belonging to the Sixth Suite, variously recalling both Couperin and Rameau, and another belonging to the Third Suite, eloquent, flowing, and with some deliciously dissonant moments, highlighted by the equally delicious, but astringent tuning that gives a bite to much else in the programme. A stylish performance, with supple body, though in no way lacking in sensibility. Recommended." I have another recording of Le Roux' Pièces de clavessin (on Arkadia), and the notes have a rather interesting story about his life: apparently not a single record of the so-called Le Roux exists apart from that score. No concert attendance (very publicized and mundane events), no address, no house, no nothing. The author goes on to mention the strong stylistic affinity between D'Anglebert's harpsichord works and Le Roux' style and further conjectures that he was actually D'Anglebert's own son. Widely known as one of France's foremost harpsichord virtuosos, D'Anglebert Jr was loathed by Couperin because of his court positions (he was "Claveciniste du Roy"). In turn, he was very much in awe of his famous father's renown as a composer and might not have dared publish anything under his own name for fear of comparison. I'm not sure about that scenario. Both recordings date from 1993. Given that the above story is player Iakovos Pappas' own conjecturing, it's very possible that Rousset was unaware or just uninterested in participating in it. But the thesis of a pseudonym seems very logical. In reply to my query, Harmonia mundi informed me that they plan to reissue this 4CD-set of the complete symphonies at end of this year! That is good news indeed. It was for long on my list! Thank you for all the trouble Que. I'm very much looking forward to it as well - beats paying outrageous prices for old copies. Mine wasn't outrageously priced - and came with the notes! 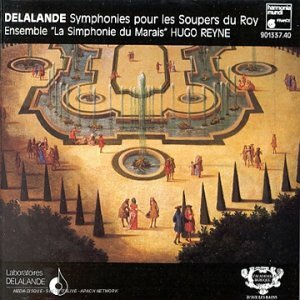 Seriously, Reyne is all he is cracked up to be - second to none in interpretation of Lully (on Accord) and other French music of his time (imo). Alas it was ebay... But there is no doubt that the performance will sound beautiful, be it original or reissue. Well its reissue for us then......that means waiting! Wait until you hear the xylophones and cymbals (a la gamelan) in the Airs des Siamois... worth every penny! Need bit help. I'm trying to figure out how much of various Couperins' harpsicord music Gustav Leonhardt did record (or at least what is on CD). I believe Leonhardt's Alpha organ disc includes some selections from F Couperin's Organ Masses also. It's not exactly "harpsichord music" though. I would say Rameau is easily the best of the French, producing some superior quality material. But this quality is not so consistent over his output from what I've heard, so he's not quite in Handel's league. But he is capable of some nice melodic touches. Organ transcriptions of course were not a nineteenth-century invention, and here the historical JE Isnard (1774) organ is put to superb use presenting some most glorious moments from operas by both Lully and Rameau, with colourful registration and stylish playing to boot. Pierre Bardon wrote an informative note about the instrument also. A very good £2 spent (off ebay) as far as I am concerned. Organ transcriptions of course were not a invention, and here the historical JE Isnard (1774) organ is put to superb use presenting some most glorious moments from operas by both Lully and Rameau, with colourful registration and stylish playing to boot. Pierre Bardon wrote an informative note about the instrument also. A very good £2 spent (off ebay) as far as I am concerned. I really should visit ebay more! Looks like a very nice disc - French organ music - and French organs (!) are growing on me. So, I definitely keep this in mind. Got this Le Roux disc recently, spurred by Drasko's earlier post on him. 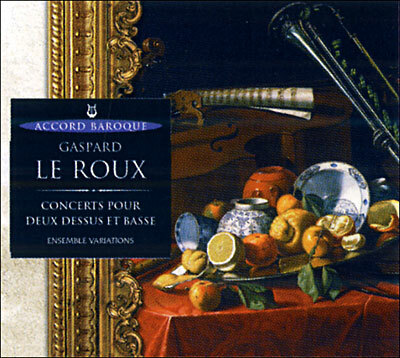 Gaspard Le Roux wrote alternative "concert" versions for his "Pièces de Clavessin", to be performed by wind or string instruments and continuo or, alternatively, on two harpsichords. Presented here are performances with violin, traverse flute, viola da gamba, theorbe and harpsicord. The préludes were only written in a version for one harpsichord and are played by Olivier Baumont. I was impressed by the music - they are a match for Couperin's Concert Royaux - very charming and catchy. Expertly done by Baumont c.s. Recommended. Thanks, Mr. Q, this is right down my alley . Now, I only have to locate a copy. Thanks, it is my first encounter with the label "Accord Baroque" - which is issued by Universal France. How is for instance that Gilles Motets disc, Drakso? 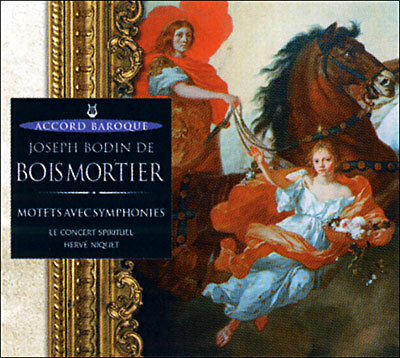 My other purchase on Accord Baroque is my first acquaintance with composer Joseph Bodin de Boismortier. Boismortier was apparently a prolific composer but wrote very little religious works. This disc contains them all. Firstly a colourfull seven part "grand motet" with all trappings: first and second violins and oboes, recorders, trumpets and kettledrums. Secondly six motets with soprano, here exquisitely sung by Véronique Gens (!). This disc is recommendable for these beautiful motets with Véronique alone. Performances are top-notch, we also have counter-tenor Fouchécourt and the ensemble "Le Concert Spirituel" under Hervé Niquet leaves nothing to be desired. Boismortier's style is colourful in the motet and has a certain light, uplifting, "Handelian" quality overall. Not the seriousness and solemnity of the religious works by Campra, Charpentier, etc. One caveat: even with all religious works by Boismortier, playing time is still rather short measured with 45 minutes. But luckily this is not full price. I have the DVD of Lully/Moliere "Le bourgeois gentilhomme" from Dumestre and al. and it has been one of the best experience I have ever enjoyed in classical music theatre. I will look out for the Lully with avid anticipation. How is for instance that Gilles Motets disc, Drasko? It might be quite some time until that one gets serious listening time, pretty swamped these days. From initial spin I can tell you that there is one motet and three lamentations. Motet is very nice but didn't quite make me go "Wow!" (what Delalande's Confitebor Tibi Domine and Super Filumina Babylonis did big time), Lamentationes are very good, toned down ornamentation, solemn but not dreary. Can give you few words on composer - born in 1668 in Provence in poor family, become choirboy at chatedral of Aix-en-Provance and raised to choirmaster by 1693, held that position for two years and then just took off and wandered around for the next ten years, died quite young age 37 in 1705. Had one smashing hit in Requiem, perfomed at funerals of Rameau and Louis XV. Performers are the same bunch as on that Boismortier disc - Gens, Fouchecourt et al - Le Concert Spirituel under Niquet, so you already know how they sound, recording is from 1988.